If there should be a sence in trading 0.01 on a 10k-account I please somebody to explain me. The full prize is leveraged only x 20 ??? To be 100% honest, I don't have the numbers myself, I will chase internally and revert to you (I reckon the first one gets *30, but I am not 100% sure!). As I understood there is a linear ratio between 1rst place and 48th place. 48th place obtain * 15 and 1rst place obtain * 30. Maximum allocation equal EC * Ratio. I have read email, blogs from Darwinex, pages of bla bla, and then dont catch a word. I will fwd your feedback internally so my colleagues write clearer content. Yes this makes sence - if I am a Trader with a few million AUM. Does it give (gave) too much money via the darwinIA? I think it. There, it is a means quite simply of giving less big aum. I expect the comptability of darwinex is good and it's not a way to prevent a crisis. I hope ! DArwinIA is a good commercial tool but Darwinex (and darwins) are best. I think we have to understand things about business model of Darwinex. There are traders and there are investors. But traders are customers, they are thousands. Few of them get AUM. Darwinia is a pretty game where trader can gamble. The question is : what is the sum of EC of traders ? Is it a small part of the whole EC of the customers ? Or a main part ? If yes, how to increase this involvment ? One question....what happen to the capital that is not allocated? Will not be allocated or they will be given to the "next in line" ? I already have a decent equity but suppose a guy that has a DScore>70 and is trading with 500 and 0.01. What shoud that guy do? Try to upscale to 10k and 0.2 in a week? Park/deposit 9500 reducing his VaR by a factor of 20 and increasing the multiplier of the darwin by x20 in a week? DarwinIA is a way of incentivising traders to trade in a consistent manner. 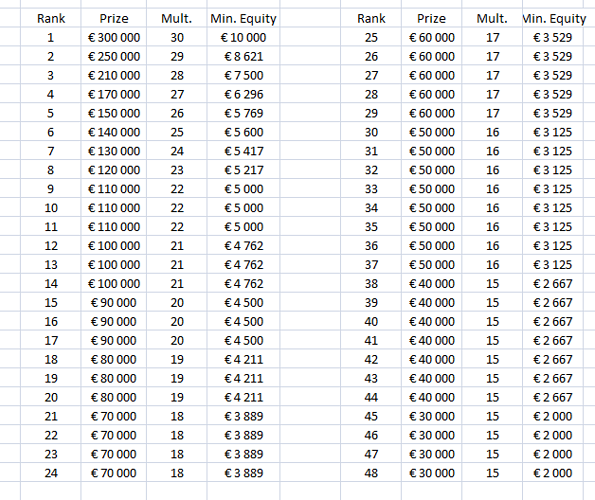 Darwinex invests 4MM of nominal capital in the 48 best DARWINs of the month. 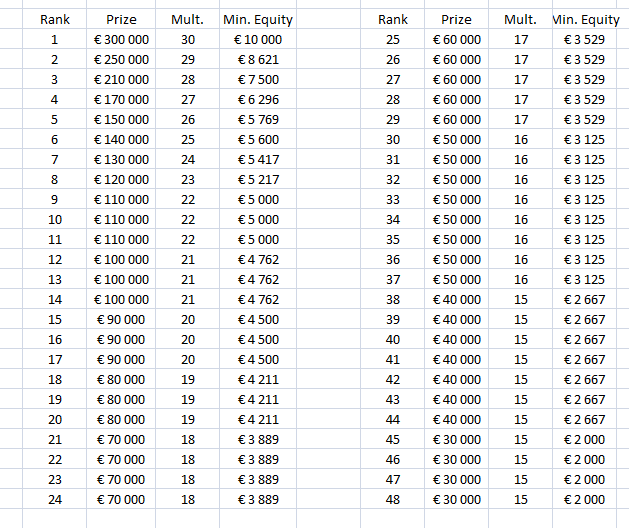 Another question.... suppose I have an equity of 15.000€ and I win the first prize in november. (yeahh!!).... then... in dicember I win again ... first place.... can I still get the prize of it is necessary to have 30.000€ ? An example is DWF . A better way is to apply proportional investment. It means that more the EC, more lots. If you have more money, you open more lots. It's obvious, but I have seen many EA developers sending fixed lots beaucause they will have enough time to send a new size later. On the other hand, proportional investment create an anti martingale effect. You win with 0.02 lots, then you loose with 0.03 lots, then you win with 0.02 lots etc. This has a tremendous anti martingale effect. That is why most people prefer fixed lots until it is time to change. The Kelly Formula come from this effect. But I never find and interesting white paper about this idea. So, after considering this complexe debate, very low VAR is a good tunning decision. Good. I would only hope (but apparently it will not be so) that you will not do this for all the old grants, but only starting with the grants received from December 2018, but it is better to start this from 2019. I think it would be more honest (maybe?). And if my opinion may be interesting to someone - the indicated coefficients are too high, 15,000 or even 10,000 is quite a serious amount. Yes, I'm the that guy from a small village, and I suggest all the same to change the coefficients. I also really thought that in Darwinex, good traders who do not have large capital can count on competing with richer people, but apparently this dogma is changing. Equal conditions for all will be no more. The rich will get richer faster than the poor, if the poor can even make a living, just like in life. No, if you have the required EC amount, you are entield to get the price every months. Then, prizes could be cumulated. Should be something like this? this sum up with the other question... if is 1) or 2) who will get the remain allocation? This go against every word Juan Colon has been talking about empowering the small trader the last years, but anyway is their business, but I have to say that Darwinia is the only incentive that I have to stay in Darwinex after the ESMA leverage changes. Thank you for reading.